Produced in the French Cognac, created by an Irishman, renowned all over the world. Hennessy is certainly the most famous cognac in the world. It is appreciated not only for its unique flavor, but also for its creative soul which inspires musicians and artists of all nationalities. How to speak about the brand's rich heritage and artistic collaborations and to interest the younger audience with the extraordinary history at the same time? The solution turned out to be the first Polish content hub for a brand which included music, street art, cocktails and concert reviews. There is a belief in Poland that cognac is a serious beverage for serious gentlemen which should be savored only at serious occasions. Meanwhile, the world of Hennessy includes unique cocktails, urban bustle, street art, hip-hop and unusual artists who never stop. The brand has been accompanied by this motto for years: NEVER STOP. NEVER SETTLE, which shows its energetic nature and the type of personalities with whom it most often cooperates. 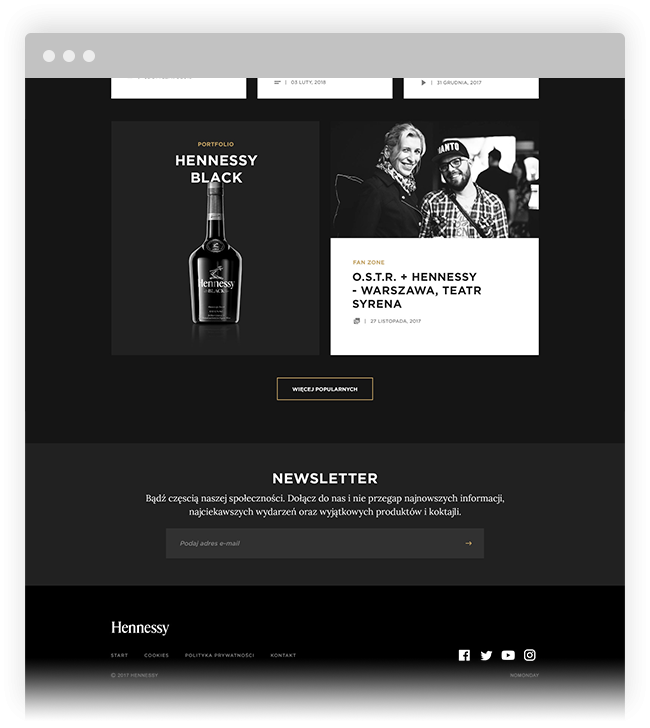 To illustrate is to the Polish recipient and to attract 20-30 year olds to the brand, we have designed and implemented the www.hennessy.pl website - unique in this scale of product groups. 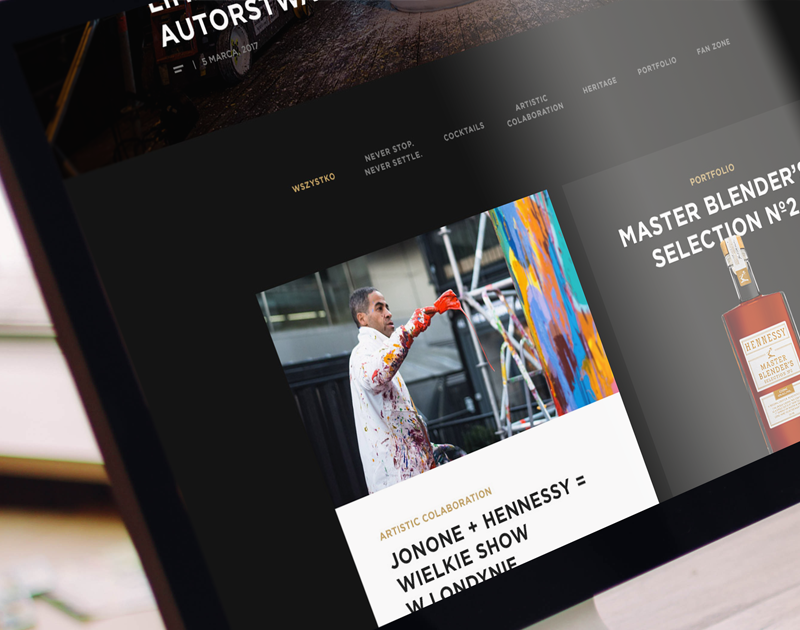 The website was developed as a content hub which presents the richness of the Hennessy world and allows the recipient to become familiar with the most interesting artistic projects and events which accompany the brand. Hennessy has stories to tell. Artists who cooperated with the brand over the years include: Nas, Erykah Badu, Pharell Williams or The Strokes. The group of street artists with whom the brand creates a unique limited bottle of Hennessy Very Special every year is also numerous. Just take a look at the number of pieces of music which refer to the noble cognac to understand its popularity among artists (the word Hennessy was found in more than 700 song lyrics and the abbreviation itself may be found in more than 1,000 works). The "tile" layout of the content hub, filtered by content type, is a bow to the contemporary recipient who expects high transparency combined with the diversity of topics. It was also important for us to show that the brand's world is alive and changes continuously - according to Hennessy's motto. The prime place in the website was, of course, occupied by content devoted to the brand's Polish ambassadors - the rapper O.S.T.R. and Wojtek Urbański - the world champion in Classic Bar Tendering. Subsequent sections were dedicated to: the cooperation with artists, Hennessy cocktails, the brand's heritage as well as cultural events. We also presented the portfolio of alcohol products. The website's navigation tools enable the filtering of "tiles" and choosing articles which are the most interesting for the user. The content's legibility is increased by carefully selected typography, a stylish pallet of colors and photo galleries. There also is video content and the chance to embed a full-screen movie. The user may also choose cocktails by their sophistication degree. The website was designed on the basis of an original CMS, according to the assumptions of RWD and mobile designing. 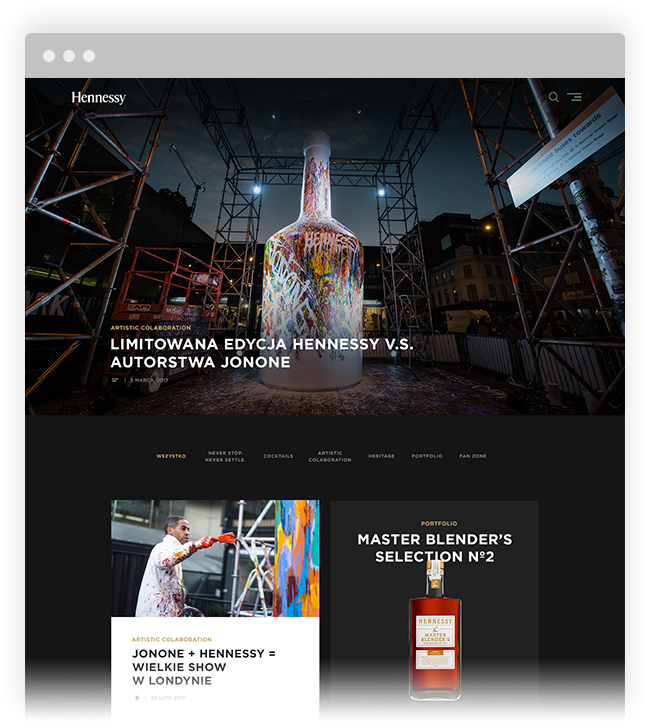 Hennessy.pl is our second content hub project. 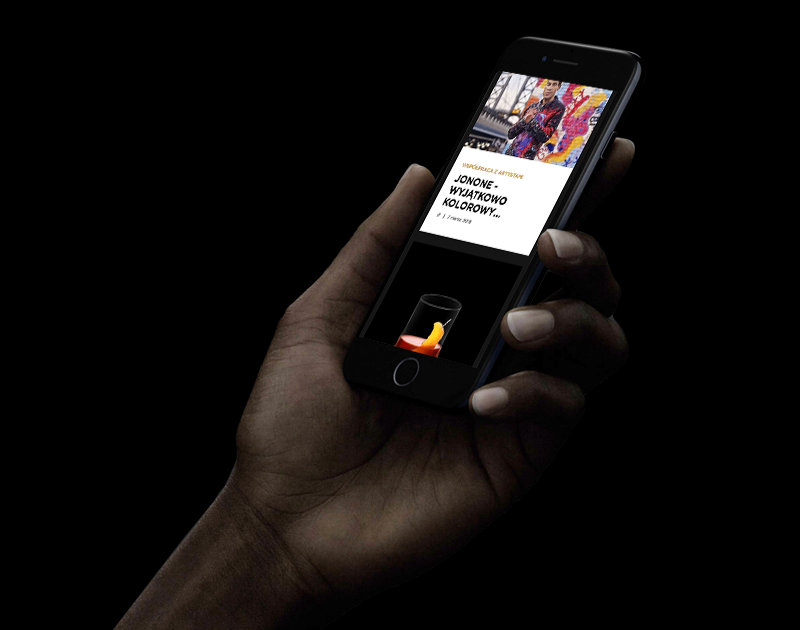 Although the website will present content completely different from content which may be found at APA Lab, it shows that branded content is a very important element of the brand's digital strategy today. It doesn't matter whether you tell your customers about smart homes and robots, or the constant passion to create, your brand must have a space in which its history will be heard properly. A well-designed content hub is the perfect place for this purpose. IT IS TIME FOR YOUR COMPANY. FEEL FREE TO COOPERATE WITH US.